For the next few weeks, we'll be seeing magnets from Ned & Marta's refrigerator door. 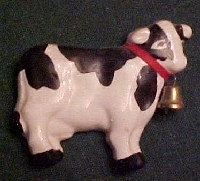 There's no reason, that Ned knows of, for the cow. It's always good to travel with a gimp. Several friend of mine qualify for disabled persons placards and while I would never abuse it, when you have the person who owns the card along, it sure makes life easier. Today, Diane and I drove up to Skagit County's tulip festival, which my friend Mary had told me would be absolutely fabulous. The sun was shining, the skies were clean and clear (and gas was only $1.50 a gallon, compared to $2 in Davis!). I drove, so Diane could relax. She had the job of navigator. We hit heavy traffic 10 miles out of Edmonds and were afraid that everybody in Seattle had decided to go see the tulips, but it did clear up eventually. 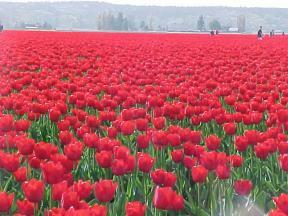 For an event that is so incredible, the tulip festival has got to be the best kept secret in the Pacific Northwest. There are no billboards on the freeway and California folks rushing up I-5 would be hard pressed to know that they were only a few miles from a patchwork quilt of incredible beauty. Not only are there no signs on the freeway, but the small signs you find when you get off the freeway aren't always right. We stopped at a store that advertised "tulip maps." Turned out they had run out of them, and were giving away a very bad xeroxed sheet of paper that my navigator could make neither heads nor tails out of. We came across one tiny signs indicating a turn to the left for the tulip festival. It wound around through some lovely countryside, over a babbling brook, with the fluffy white clouds and the snow-capped mountains in the background. A bucolic scene with cows calmly chewing their cud, horse tails swishing away flies, and farmers greasing their farm equipment. Some houses had a few tulips planted in front of them, but we encountered not a single tulip field and the road led us back from whence we had come. We tried a couple of other roads headed in the general direction of the tulip fields, always finding a road that managed to pass through lovely countryside (we decided that farmers around here are doing a booming business in the production of dandelions). We finally stopped for lunch. It was a choice of McDonald's or the Mexican restaurant next door. The Mexican place won because it had tulips painted on the window. It turned out to be a good choice. You always have a good chance of authentic food when you pick an ethnic restaurant where there are at least as many of the natives eating as there are tourists. Our lunch was huge and delicious (and gave us enough leftovers for dinner tonight). At the conclusion of lunch, Diane asked the waitress, "Which is the quickest way to get to the tulip fields," hoping she could tell us which road to take. The waitress, whose first language was not English, looked sad and said, "There is no quick way. Too many people." She then told us to take a street which we never did find--ever. However, sooner or later we happened upon a large, slowly moving stream of traffic and figured we'd hit paydirt. Yes, we had. We were about 5 miles from the first tulip field we encountered and when we finally got there, it was well worth the wait. The colors were vivid and stretched as far as the eye could see. The setting was magnificent. I think I took 50 pictures here alone. 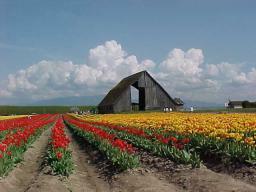 When we'd had our fill, at long last, we drove over very rutty roads back to the highway and got on another side road leading to "Tulip Town," one of the major attractions. It was a distance of about half a mile and it took us at least half an hour to get there. But it was well worth the wait. Diane and I were directed to the very front of the place, past all the cars parked very far away, to where the handicapped spots were. I decided to pay to go in to where I could stand on an overlook and take pictures. As a senior citizen (defined as 55+), I only had to pay $1, so the combination of the gimp in the car who got me great parking and my advanced age, which got me a reduced price on admission, I didn't come off too badly!! 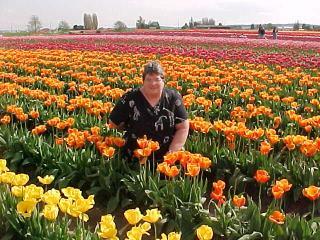 I was getting concerned about the capacity of Diane's oxygen tank, so we left after Tulip Town intending to drive straight home, but I couldn't resist stopping at one more field, which was planted entirely in red tulips. We finally made it home, Diane's oxygen tank having been depleted about 20 minutes before we got here, and I left her hooked up to the home system while I went out and rented a movie for us to watch tonight. I've put together a slide show for her to send to her brother (who was here last week, before the tulips bloomed), and now I'm going to try to get some sleep myself. It was a pretty spectacular day!